Today I thank you. The readers. Readership is at an all time high. If you check the right hand column, run guru says has been running since March 2011. I also posted over 3000 columns from ’01-11 under the team Nebraska dot com banner, those, for better and worse, vanished during transition. Close to 6000 total columns and as you know, I’m not done yet. Finishing 2018 with 620 miles. Happy for each step. Miles built on patience and acceptance, bolstered by hope and challenge. Looking forward to a consistent and healthy 2019 and doing some racing. Look out all you 60+, coming to get you! In the past I’ve given out a series of Year End Awards. Acknowledging superlatives. Recognizing excellence. This year it is an easy give. You. The readers. Thank you for sticking with me. Here’s To You! This entry was posted in Uncategorized on December 31, 2018 by runguru. The long range forecast? Speed! The weather gods have rewarded our Good Clean Living with near perfect conditions for you at the Rust Buster 5K on January 5th. Low above freezing and high in the mid 40s. Your best opportunity to Run to Your Potential. It will also be a Grand Day for me as I celebrate dad’s 87th birthday! Born in 1932, growing up in the heart of the Great Depression. One of America’s last Real Cowboys. My hero. We’ve started crafting our elite field for America’s Marathon-Valley 7 Lakes. The response has been robust. The Right Marathon at the Right Time with the Right Course. Usual hubris pushing me to the stump, I’ll suggest today that we will see new State Records for both men and women’s marathon. And quite possibly the half as well. A gathering of some of the most serious and talented runners in America bolstering my spirits. Our elite entry standards were announced yesterday. Standards based on and geared towards National Class talent. Co Race Director Linda Kunasek having major input, her 10 years as USATF Women’s LDR Athlete Development Chair a big asset. Our Elite Amenities Package similarly based on over 20 years experience working with America’s top athletes. Taking a little bit from this race, a little bit from that race, adding a couple of new twists, and Viola! Nothing more important though than the course, of course. We’ve also offered the package to our Nebraska athletes, reaching out to the Lincoln Running Company Racing leadership,offering some of our homegrown talent the chance to run Freaky Fast. This entry was posted in Uncategorized on December 28, 2018 by runguru. The more trips around El Sol, the more you are exposed to the vastness of humanity, the more you understand just how diverse we are. Some 2019 observations germane to the sport we love. We are all Runners. Not all of us are Racers. This is perhaps the most significant generational shift in our sport. Try and imagine a time when Racers Were The Only Runners. In the 50s and 60s and 70s and into the early 80s. You were In It To Win It. In the mid 80s brilliant fundraisers figured out how to co-opt our sport for their particular charities. Not saying it is wrong but it has reshaped our sport completely. (Won’t throw in the towel and say irreversibly.) Hubris allows me a claim of expertise on this subject. Founded on nearly four decades of advocating, founding, fighting, losing, and winning. I’ve been buoyed recently by a trend though. More runners are returning to the very heart of our sport. Training with determination. Trying to challenge themselves to run to Their Potential. Relative talent having no bearing on the results. What matters most is that they give their all. Achieving personal pinnacles and satisfaction that can only come from dedication and suffering and courage. The essence of our sport. It is a small percentage, but just as assuredly the numbers are increasing. You don’t have to run a 6 minute mile to run to your potential. If you are acquitting your daily workouts with honesty, feel that you have given your all, you too are In It To Win It. This entry was posted in Uncategorized on December 27, 2018 by runguru. My soft side flowered for a couple hours yesterday. Katie (21), Allison (24) and my dear sweet Linda. 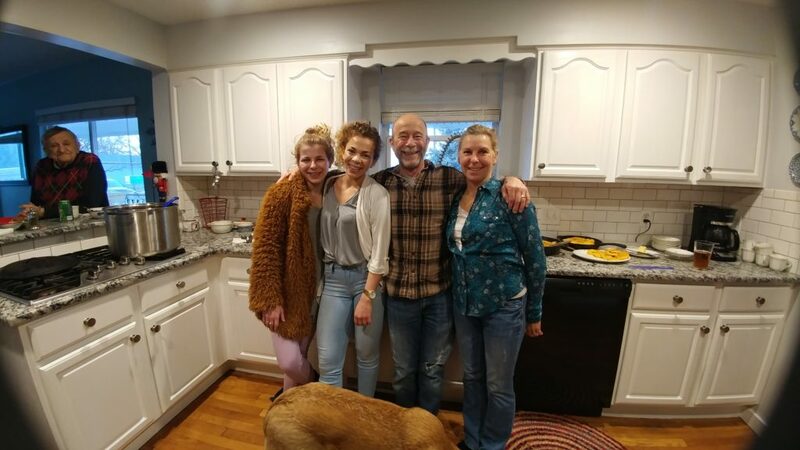 My two beautiful daughters and the love of my life. Photo bomb by Coach Kunasek. I hope your day was a joyful as mine. This entry was posted in Uncategorized on December 26, 2018 by runguru. Let’s host America’s Marathon here! A Closed Road Course! Right here in our state! We’ll be the First and we’ll make it Great! Then asked our friends from around the U.S.
What will it take for us to be best? This entry was posted in Uncategorized on December 24, 2018 by runguru. This has been a wacky year to be sure. So many metaphors dancing between my ears. I’ll kick off this year’s reflections with two of the most recent an unbelievable achievements. Our old Run Guru Mate (now with HOKA and Squirrel Nut Butter) Pete Kostelnick, what can you say about this fella? His run from Alaska to Key West wasn’t enough. Why not go for that big enchilada? So he did just that last night, running two miles to bring his 2018 total to 10,000 miles. You may pick your jaws up off the floor. And how about 70 year old Gene Dykes of Pennsylvania? He broke the world record for his age by running 2:54:23 at the Jacksonville Marathon. Pancake flat and record eligible. He knows how to pick them! That is 6:39 pace folks. Be sure and get signed up for the Valley 7 Lakes Marathon- America’s Marathon! Entry fees go up January 1st and we are 33% sold out! Runners from 14 states have signed up to Run To Their Potential! Be sure and reserve your spot on the line and be part of Nebraska marathoning history! This entry was posted in Uncategorized on December 21, 2018 by runguru. We are pleased to offer you the 2019 Two Rivers Winter Fitness Series. A good chance to get out and shake away the winter doldrums. 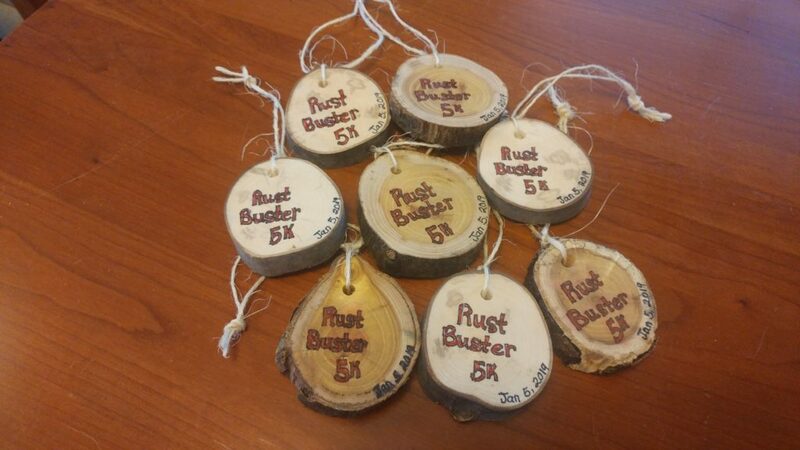 The Rust Buster 5K kicks things off, the Full Wolf Moon 5K follows on January 19th. This is our 6th year to host, the last 5 years with our friends at Two Rivers State Recreation Area. The park’s leadership and staff and snowplows working with us to ensure you a safe, closed road experience. USATF Certified and Sanctioned. Pancake flat. 1.5 mile loop inside the scenic park. We would like to invite everyone to come join us. We will feature Linda’s hand crafted participation awards, home baked goodies, hot chocolate and apple cider, and a splash of something extra for those inclined and of age. Door prizes, official times, camaraderie, and more. Perfect for New Year’s resolutions, first timers, walkers, and also kid friendly. We hope to see you there! This entry was posted in Uncategorized on December 20, 2018 by runguru. The message is slowly and surely spreading. Thank you. This Wednesday we celebrate the Joy of Pain. And those that embrace it, encourage it, demand it. As their personal litmus test. Defining themselves as Real Runners. Are you a Real Runner if you don’t dip into that well? Sure you are! If you have never dropped your bucket deep you are still in it for your own personal, and valid, reasons. We all share the joy. But if you omit the suffering you are missing out on some of the best of what running offers. Volition. The faculty or power to use one’s own will. Running the one arena of life where no one but you can control your discomfort, your suffering, your pain. It matters not how fast or slow, how old or young, how thin or heavy, how raw or experienced. Running offers us a transformative opportunity. This entry was posted in Uncategorized on December 19, 2018 by runguru. It’s an amazing time to be alive! Our society flush with every manner of easy does its. See something you don’t like? Viola! Filler for every nook and cranny! Enhancements, reductions, injections, and suctions. Why? When you reach your best you become comfortable in your own skin. No further engineering necessary. And all that is superficial anyway. You are reading these musings because you are a runner. Most runners have accepted the grand design, whether too tall, too short, too skinny, too heavy, too anything and too everything. We’ve accepted our bodies, though we never stop applying the crop. Its how you apply that crop that brings results if you are interested in becoming a better runner, your best runner. A perfect morning greeted 20 runners for our first Flash 5K. Most all brand new faces, some running for fun, some training for races. We all struck a unifying chord. Running with others adds dimension to an otherwise lonely pursuit. Mutual support, camaraderie, free exchange of ideas, stories shared, inspiring and motivating for one and all. Becoming a better runner. Your Best Runner. This entry was posted in Uncategorized on December 18, 2018 by runguru. Where do 2800 ugly Santa’s park their reindeer? At the Finnish Line! This entry was posted in Uncategorized on December 17, 2018 by runguru.